This week, a French president visited Rwanda for the first time in something like 25 years to try and mend diplomatic relations between the two countries. The already cold interactions had taken a turn for the worst a few years ago when a French judge claimed that Tutsi rebels brought down the plane of Habyarimana, which sparks the beginning of the genocide. 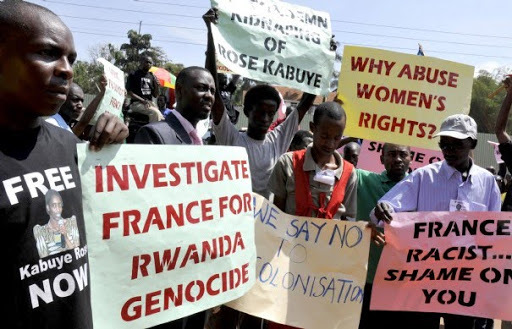 Kagame has resolutely tried to end francophone influence in Rwanda, leaving the francophonie and joining the commonwealth, and has continuously claimed that France was an accomplice in the Genocide, as a recent Rwandan report alleged. I suppose that France, along with other members of the international community (whatever that means), could accept some responsibility in not preventing the genocide, although they would probably have received as much criticism for neo-colonialist meddling. What I’ve never understood is the international pandering to Kagame. He’s a warlord from the outside that wanted power and seized the opportunity of the genocide to reach his goal. Why do people who can accept the evil of 800 000 people being killed with machetes can’t accept the evil of a man rising on the graves of his fellow Tutsis to get into power. The “genocide approach” to Rwanda has completely taken politics out of our evaluation of Rwanda and there can be no criticism of Kagame, for fear of being seen to be insensitive with genocide victims. But the people in power are not the victims of the genocide. The people in power are the rebels from Uganda that didn’t experience the genocide. Of course, Kagame can be seen as not “as worse” as other African leaders. But the difficulties of Rwanda are real, especially in terms of democratic deficit, and I’m not sure that recreating the conditions under which the Tutsi dominate the army and State institutions, in a country that is 84% Hutu, which created the resentment in the past, is a very good idea for the future. And that’s without even going into the influence Rwanda has in the destabilization of neighboring states, such as DRC. If there hadn’t been the genocide, i’m not sure that Kagame would be so immune to criticism. And in the same way as I find it completely beside the point when israelis (and jews) brandish the Shoah as an irrelevant moral shield against current criticism, I think the 1994 genocide cannot be an excuse for Kagame today. Recognizing the past is in no way the same as excusing the present. This entry was posted in France, genocide, Kagame, Rwanda. Bookmark the permalink.